UMAA has Five (5) separate divisions to meet the needs of our members. All UMAA memberships (for all divisions and membership types) are on an Annual Basis (calendar year). Each Dojo or Affiliated Organization within the UMAA is required to be registered with the Association. 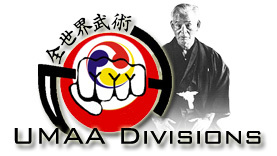 All Dojo or Affiliated Organization registrations will be issued a Registration Certificate (Charter) from UMAA. Each UMAA Dojo or Affiliated Organization must be supported by a State or Regional UMAA representative. In this manner the Dojo or Affiliated Organization is guaranteed to have a specific individual responsible for supporting their program. New Members/Dojo/Organizations may request to become the UMAA representative for their state if none exist. In this case, the Regional representative will assume responsibility of assisting the new State representative dojo/organization. All students of a UMAA Registered School should be registered members of the Association. All Black Belts are highly encouraged to become UMAA Life Members. In the case of those Dojos/Affiliated Organizations only involved in the UMAA Okinawa Kobudo Division, all individuals of the member body training in UMAA Shorin Ryu Kobudo are expected to be active individual members of the UMAA. Active UMAA Individual Membership will be required for any such individual to receive rank certification in Okinawa Kobudo from UMAA. All "Life Members" of the UMAA are authorized to receive rank certification and promotions from the UMAA and wear the UMAA Life Member patch. If you have any questions or need further information, you can contact us by mail, phone, or email.